Sometimes, it seems like there is never enough time in a day to fit everything in. That's why I had to consider if I could even accept an invite to try a new Italian bistro out on Denman named Cosca. You see, the meeting time was at 6:00pm. Problem being was that my meeting after work would go until at least 5:30pm. Another issue was the location of the meeting - Ladner. So here's the deal. I had to make it from Ladner, through the George Massey Tunnel in rush hour all the way deep into Downtown within 30 minutes. The possibility of that happening is as good as Luongo stopping a shot on his belly. You know what? I made it by 6:05pm without breaking the speed of light... I guess I really should lay off Luongo, I am a goalie myself! I wonder what the players think when I let in goals from behind the net? So as I walked into the place, which was formerly Dulcinea, Ronald from Eat Marketing was there to greet me. 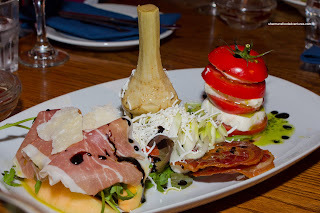 The deal was that we could order an entree of our choice in addition to sharing some appies as well as dessert. Once we made our selections, the dishes came out fast and furious. The first to arrive was the Antipasto Platter consisting of Prosciutto & Melon, Crispy Pancetta, Artichoke Heart and Tomato & Bocconc ini. Well, nothing particularly amiss with this plate other than the fact it was really hard to divide the items. Everything was of good quality and honestly, that was expected since they were trying to impress. The next item I sampled was the Vongole in Brodo consisting of Manila clams braised in garlic, white wine, herbs, olives, capers and tomato. With all the acidic ingredients, there was a certain level of tartness which was good since it helped balance the saltiness of the dish. 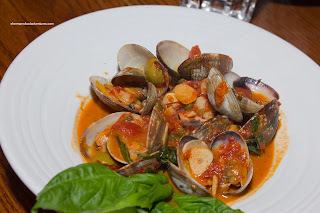 The clams were sweet and plump which made this a decent appie. 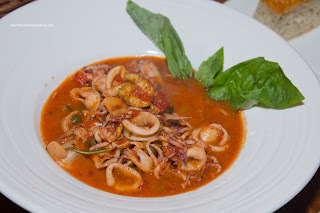 Next was the Calamari Livornese which had a very similar flavour profile as the clams. Once again, there was tomato, garlic, capers and olives. However, there was a spicy kick which really added another flavour dimension. Once again, the acidity from the ingredients were welcomed since it really livened up the dish. As for the squid, the pieces were tender and not overcooked. Continuing on with the tomato theme, we had the Malanzane Arrosto or roasted eggplant, basil marinara and smoked mozzarella. This was very well-executed. 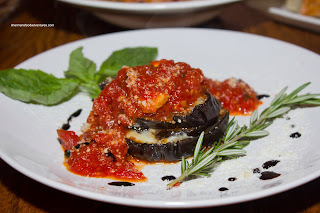 The eggplant was soft while still retaining its shape and some texture. It had depth of flavour from the roasting. The marinara exhibited, once again, a good level of tartness which was contrasted by the ample amount of cheese. 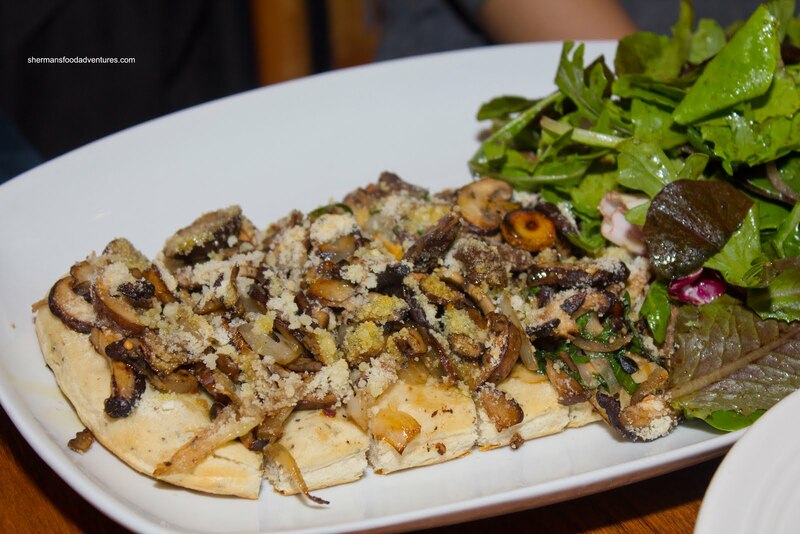 The last of our appies was the Funghi Selvatico consisting of a flat bread topped with mushrooms, caramelized onions and pecorino-romano. I actually quite liked this one and was probably the best of the bunch. The bread was soft and I thought the dough was properly seasoned. Furthermore, the mushrooms were nicely sauteed exhibiting a nice woodsy essence that meshed well with the sweet onions and saltiness of the cheese. Since we were all having a main all to ourselves, it would limit our exposure to the rest of the available dishes. Therefore, a few of us decided to share what we got with each other. Perfect! For myself, while I was listening to the daily features, the Lamb Osso Bucco caught my attention. When it arrived, I was rather taken aback at the portion size. At first, we surmised it was a "special order", but upon further inspection of the surrounding tables, it was indeed the actual size. The shank was cooked beautifully being fork tender while still maintaining a rich meat flavour. 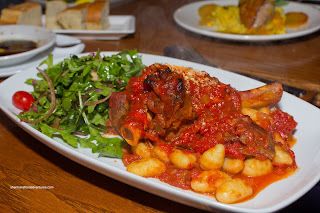 It rested on a huge bed of potato gnocchi which were of the denser variety. Personally, I don't mind it being heavier, yet in this case, it could've stood to be lighter though. Without trying to sound predictable like Luongo in a shootout (boy I'm rough on him! ), the tomato sauce was once again tart and a bit salty. This time around, there might have been acidic overload since the red onion salad had a tart dressing as well. Dee had the Pappardelle Boscaiola consisting of fresh egg pasta, wild mushroom ragu, smoked mozzarella and truffle oil. 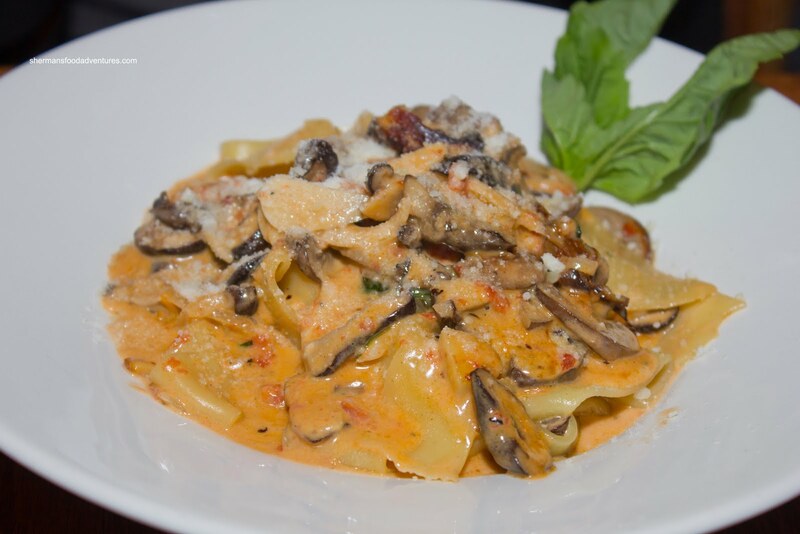 Due to the nature of the fresh pasta as well as it being of the egg variety, it was understandable that it was on the softer side. If the picture seems to indicate a very rich sauce, then your eyes are not deceiving you. This was a heavy and creamy pasta dish. However, that was the point and combined with the ample use of garlic in addition to the fantastic mushroom ragu, there was no absence of earthiness. Oh and the drizzle of truffle oil didn't hurt either. Sitting to my right was one of the writers from Coffee Foodies and it was a pleasure to meet her. 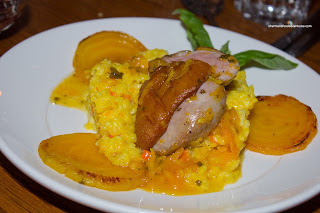 Her choice of entree was another one of the featured items of the night being the Orange Saffron Risotto with duck and golden beets. Honestly, I didn't like this dish. First of all, the risotto was overcooked. Second, the orange was overpowering and almost tasted like marmalade. Third, the duck was slightly chewy in parts. The one positive was the nicely prepared beets. 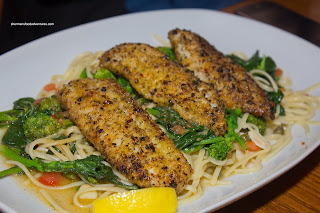 Ann had one of the other specials that I was considering in the Seared Red Snapper on a bed of linguine and broccolini tossed in white wine, garlic and herbs. Yet again, we were amazed at the portion size, these were not small fillets. I thought the fish was cooked properly, although the crust was quite salty. However, it was necessary since the linguine (which was a tad past al dente) was bland. If ate together in one bite, it worked. 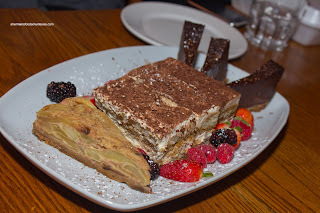 At the end, we were presented with a dessert platter consisting of Apple Cake, Tiramisu and Chocolate Torte. I found the apple cake a bit weak in flavour. There needed to be more tartness and even more sweetness too. With that being said, the apples had a nice texture. By far, the Tiramisu was the best item on the plate. It was light, not too sweet and had a good balance of flavours. I kept taking bites of it despite being very full. As for the chocolate torte, it was also not too sweet and had nice dark chocolate taste. However, the texture was slightly off. It was too dense. Overall, the food we tried was not bad. The one overarching theme was the portion size to price ratio. Nothing on the menu is over $20.00 and considering the Downtown location, that is very reasonable pricing. Sure, some dishes were better than others, but that is to be expected. Would you go again on your own dime? And I was driving people mad with my comments. Completely non-sequitur but, hey, nothing new! nice you meet you also! Wow, great Sherman. I'm glad you liked it! Kevin...come meet me....and bring your camera and your appetite! I'm Ron's business partner at Eat Marketing. 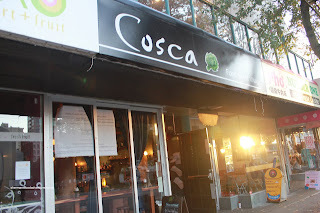 I just wanted to say thanks for taking all the effort to come out Cosca from Ladner. Personally I love the eggplant dish myself which I've had and enjoy the citrus and sharp flavours that come with the eggplant. As for goalie...I used to play a few years ago. Goalies never gets a break, it's always all glory and guts, or no glory and you're a loser. Hopefully I'll catch you next time. Take it easy and have an awesome upcoming weekend. Kim stop following me D: it's kind of creepy, I don't have what you want! @Kevin If I were in the area, I'd give it a go again. Not my first choice for Italian, but certainly not somewhere I'd avoid. @KimHo You drive everyone mad! @coffeefoodies LOL, I didn't know what nickname to use for you though! @RonaldLee Thanks for the invite!